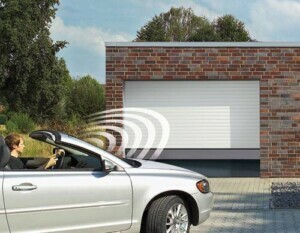 If your garage door is in need of a makeover, don’t despair! A lick of paint could spruce up your garage door, making your entire home look smart and fresh. 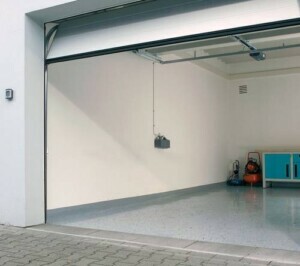 Before you begin painting your garage door, you will need to ensure that it is sparkling clean. To remove any dirt and dust, you should scrub the door using warm, soapy water and a firm bristled brush. If you have a wooden door, you should lightly sand the door down with 180-grit sandpaper before scrubbing it down. You will need to remove any door fittings, such as handles and hinges, which show on the outside of your garage door. If you cannot remove them, simply cover them over with masking tape. Garage door paint differs from normal paint in that it is highly resistant to flaking and discolouration. Most garage door paints are suitable for both wooden and metal doors. However, if you have a galvanised steel door, you will need to use a special galvanised metal paint, which will offer you long lasting protection against the elements. If you have purchased high quality paint, you may only need to apply one coat to your garage door. To cover the surface area with ease, use a large paint brush of between 3” and 5” in size. If you are painting a wooden door, you should brush the paint in the same direction as the grain of the wood. If you notice any hairline splits in the wood, you should paint across the grain to ensure that they soak up the paint before going over the top of the splits in the correct direction. If you are painting a metal door, you should paint in such a way that you leave as few brush marks as possible. In order for your paint to dry properly, you should not paint your door in extremely hot weather conditions. You will also need to start early in the day, ensuring that you have enough daylight to get your painting done in one day. Once you have finished painting, you should leave your door to dry. Depending on the type of paint you have purchased, you may have to wait anywhere between four and 12 hours. If some parts of your garage door appear patchy or blotchy, a second coat of paint should provide your door with a more even appearance. You should ensure that the first coat is completely dry before you start painting once again. Once you have finished painting, you will need to clean your paint brush using a solvent such as turpentine or white spirit. Once you have removed all the residual paint from your brush, you will be able to use washing up liquid to complete your cleaning. If you cannot salvage your garage door with a coat of paint, you may have to cut your losses and purchase a new one instead. Contrary to popular belief, a new garage door will not necessarily break the bank – if you do your research, you will find a range of doors to suit your needs and budget. Simply contact the team at Wessex Garage Doors to discuss our maintenance services, or to get advice about buying a new garage door.